Linux live USB sticks (flash drivers) are awesome. You can carry them anywhere and give a demo of Linux on anyone's computer, any time. But how do you keep track of them? Especially since USB sticks don't have any place to write a label. How do you remember that the shiny blue stick is the one with Ubuntu Oneiric, the black one has Ubuntu Lucid, the other blue one that's missing its top is Debian ... and so forth. It's impossible! Plus, such a waste -- you can hardly buy a flash drive smaller than 4G these days, and then you go and devote it to a 700Mb ISO designed to fit on a CD. Silly. The answer: get one big USB stick and put lots of distros on it, using grub to let you choose at boot time. To create my stick, I followed the easy instructions at HOWTO: Booting LiveCD ISOs from USB flash drive with Grub2. I found that tutorial quite simple, so I'm not going to duplicate the instructions there. I used the non-LUA version, since my grub on Ubuntu Natty didn't seem to support LUA. Basically you run grub-install to the stick, create a directory called iso where you stick all your ISO files, then create a grub.cfg with magic incantations to boot each ISO. linux (loop)/pmagic/bzImage iso_filename=$isofile edd=off noapic load_ramdisk=1 prompt_ramdisk=0 rwnomce sleep=10 loglevel=0 then you know there's some magic going on there. I knew I needed at least the Ubuntu "alternate installer", since it allows installing a command-line system without the Unity desktop, and Debian Squeeze, since that's currently the most power-efficient Linux for laptops, in addition to the distros mentioned in the tutorial. How do you figure out what to put in those grub.cfg lines? Here's how to figure it out from the ISO file. I'll use the Debian Squeeze ISO as an example. Step 1: mount the ISO file. Step 3: find the initrd. It might have various names, and might or might not be compressed, but the name will almost always start with init. The trick in steps 2 and 3 is that nearly all live ISO images put the kernel and initrd a single directory below the root. If you're using an ISO that doesn't, you may have to search more deeply (try /mnt/*/*). It sounds a little convoluted, I know -- but you only have to do it once, and then you have this amazing keychain drive with every Linux distro on it you can think of. Amaze your friends! 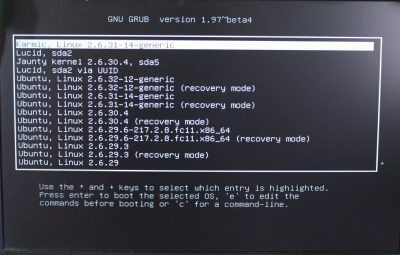 Part 3 and final of my series on configuring Ubuntu's new grub2 boot menu. I translate a couple of commonly-seen error messages, but most of the article is devoted to multi-boot machines. If you have several different operating systems or Linux distros installed on separate disk partitions, grub2 has some unpleasant surprises, so see my article for some (unfortunately very hacky) workarounds for its limitations. Why use Grub2? Good question! Cleaning up your boot menu (Grub2 part 2). I gave a lightning talk at the Ubucon -- the Ubuntu miniconf -- at the SCALE 8x, Southern California Linux Expo yesterday. I've been writing about grub2 for Linux Planet but it left me with some, well, opinions that I wanted to share. A lightning talk is an informal very short talk, anywhere from 2 to 5 minutes. Typically a conference will have a session of lightning talks, where anyone can get up to plug a project, tell a story or flame about an annoyance. Anything goes. I'm a lightning talk junkie -- I love giving them, and I love hearing what everyone else has to say. I had some simple slides for this particular talk. Generally I've used bold or other set-offs to indicate terms I showed on a slide. SCALE 8x, by the way, is awesome so far, and I'm looking forward to the next two days. What's a grub? A soft wriggly worm. But it's also the Ubuntu Bootloader. And in Karmic, we have a brand new grub: grub2! Well, sort of. Karmic uses Grub 2 version 1.97 beta4. Aside from the fact that it's a beta -- nuff said about that -- what's this business of grub TWO being version ONE point something? Are you hearing alarm bells go off yet? But it must be better, right? Like, they say it cleans up partition numbering. Yay! So that confusing syntax in grub1, where you have to say (hd0,0) that doesn't look like anything else on Linux, and you're always wanting to put the parenthesis in the wrong place -- they finally fixed that? THEY KEPT THE CONFUSING SYNTAX BUT CHANGED THE NUMBER! Gee, guys, thanks for making things simpler! But at least grub2 is better at graphics, right? Like what if you want to add a background image under that boring boot screen? A dark image, because the text is white. ... there it is! But why are there two blacks? Of course, there's no documentation. They can't be fg/bg -- black on black wouldn't make any sense, right? Well, it turns out it DOES mean foreground and background -- but the second "black" doesn't mean black. It's a special grub2 code for "transparent". That's right, they wrote this brand new program from scratch, but they couldn't make a parser that understands "none" or "transparent". What if you actually want text with a black background? I have no idea. I guess you're out of luck. Okay, what about dual booting? grub's great at that, right? I have three distros installed on this laptop. There's a shared /boot partition. When I change something, all I have to do is edit a file in /boot/grub. It's great -- so much better than lilo! Anybody remember what a pain lilo was? Oops, wait -- not with grub2. Now I'm not supposed to edit that file. Instead, I edit files in TWO places, /etc/grub.d and /etc/default/grub.conf, and then run a program in a third place, /usr/bin/update-grub. All this has to be done from the same machine where you installed grub2 -- if you're booted into one of your other distros, you're out of luck. grub2 takes us back to the bad old days of lilo. Grub2 really is a soft slimy worm after all. But I have some ideas for workarounds. If you care, watch my next few articles on LinuxPlanet.com. Part 3: Why use Grub2? Good question! Upgraded to Ubuntu 9.10 Karmic and wondering how to configure your boot menu or set it up for multiple boots? Grub2 Worms Into Ubuntu (part 1) is an introductory tutorial -- just enough to get you started. More details will follow in parts 2 and 3.